The new economic plan issued by the Government of Kuwait includes a total of 1,100 projects at an estimated value of KD37bn (US$125bn). These projects aim at developing key sectors in the country, mainly infrastructure, urban residential development, healthcare, education and energy. The plan outlines several mega and iconic projects to be implemented including the new business hub (Silk City), the Opera House, Fintas Commercial Centre, Boubiyan Island Port, and major investments in new residential cities. New city developments are included in the plan to meet the demands of its fast growing population. Kuwait has plans to create satellite cities and towns in the outlying regions mainly in Subiya, Khairan (potentially for 500,000 people) Jaber Al Ahmed City (100,000), Arifjan (up to 100,000). Estimated value: 890M KD. Project details: The project is to design and build 18,000 residential units. Client: Public Authority of Housing Welfare. Project details: Main roads plus 9574 housing units. The city will be developed over an area of 35 million m². Once completed in 2015, the city will house up to 110,000 residents. Contractor as of February 8, 2010: Combined Group Contracting. Project details: Main roads plus 5020 residential units. Estimated value: 115M KD, Project details: 1736 residential units. Soil Improvement, Road & Infrastructure. Contractor per September 2009: Mushrif Trading and Contracting Company. Estimated value: 20M KD. Duration of the project: 2012-2023. Details: The city will span 250 km² and will include 30 communities grouped into four main districts: Finance City, Leisure City, Ecological City and Educational Culture City. It will include as well Olympic Stadium, residences, hotels and retail facilities. Client: Ministry of Public Work. Estimated value: T.B.A. Details: The project is to design and build a high-end opera house with a capacity of 2000 seats. Client: Ministry of Public Works. Estimated value: T.B.A. Details: The project is to design and build the Ministry of Information Building. Client: Ministry of Public Works. Estimated value: T.B.A. Details: The project is to design and build a new airport, hotel inside the airport area. Client: Partnership Technical Bureau. Estimated value: T.B.A. Details: The project is to design and build a commercial centre Fintas area including an art exhibition,music rooms, theatre and commercial shops like restaurants, café shops and so on. (20.000m2). Client: Partnership Technical Bureau. Estimated value: T.B.A. Details: The project is to build a zoo with a ‘safari’ type of design (1.400.000 m2). Client: Partnership Technical Bureau. The economic development plan feature high profile design and construction contracts to boost the country´s infrastructure. The projects are planned in the following sectors: air- and maritime ports, highway roads, infrastructure, a railway and metro system, power, oil & gas production, refinery, water and waste management. Estimated Value 120M KD. Details: Development of nature reserves, major sea port, tourist resorts, hotels and a residential area along the coastline. Client: Partnership Technical Bureau. Estimated value: 750 M KD. Details: The Kuwait Metropolitan Rapid Transit calls for construction of a 171 Km Kuwait Metro. The Metro will be built across the inner city of Kuwait and will include 4 lines. Client: Ministry of Public Work. Project description: the Jaber Al-Ahmad expressway will link the Silk City and the satellite cities to be built in the northern area of Kuwait city.7 The Ministry of Public Work has qualified eight groups, each comprising three to four contractors. The scope of work includes construction of Jaber Ahmed Al-Jaber Al-Sabah Bridge in Kuwait city. Estimated value: 150M KD. 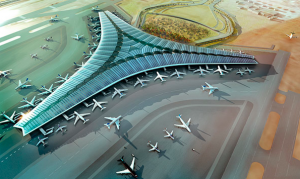 Details: The project calls for design and construction of infrastructure work for the Kuwait International Airport, including approach roads leading to the airport, runway and aircraft hangars. Contractor:Alghanim International General Trading and Contracting Company. The new development plan also includes the construction of new hospitals through the country. Estimated value: 180M KD. Details: The project is to design and build a hospital with a capacity of 600 beds (970 m2). Client: Ministry of Public Works. Estimated Value: 150M KD, Location: Sabah Hospitals Area, Details: The project is to design and build a hospital with a capacity of 550 beds (120.000 m2). Client: Ministry of Public Works. Estimated Value 150M KD. Details: The project is to design and build a hospital with a capacity of 500 beds (100.000 m2). Client: Ministry of Public Works. Estimated value: 150 KD. Details: The project is to design and build a hospital with a capacity of 500 beds (90.000 m2). Client: Ministry of Public Works. Estimated value: 15M KD. Details: The project is to design and build a Cancer hospital. Client: Ministry of Health.